PRISONERS OF WAR.—Owing to the greatly increased cost of the food parcels to the local men who are prisoners of war in Germany, the committee are faced with the almost exhaustion of their funds, and to put them on a sound financial basis to meet the expenses of the coming months a special effort is being made on similar to last year. An appeal for donations has been issued, and a flag day will be held throughout the town and all the adjoining villages on Saturday next, June 2nd. It is interesting to note that a similar effort last year resulted in £50 being raised, and the committee are anxious that this year’s effort shall not fall short of that sum, especially as the expenses now, after allowing for guarantees, are no less than £100 per month. The whole of the organisation and arrangements for this effort have been entrusted to the indefatigable secretary, Mr J R Barker, who informs us that there has already been a very gratifying response to the appeal for donations, but a big effort must yet be made by the general public on June 2nd to enable the committee to secure the funds necessary to carry on their work during the next few months. We therefore appeal to the public to give generously when they buy their flags on War Prisoners’ Day. These letters and many hundreds more may be seen at the Hon Secretary’s Office, 9 Regent Street, Rugby. They show that the food parcels are absolutely essential, and that they get to the men safely. The Rugby Committer are making a special effort to raise further funds to enable them to meet the increased cost of the parcels, and it is hoped a very generous response will be made by the general public on War Prisoners’ Flag Day, Saturday, June 2nd. The Local Government Board have considered the question of the release for military service of Dr Gibbons Ward, deputy medical officer of health for the Mid-Warwickshire combined district, as well as medical officer of health for Leamington, and in view of all the offices now held by Dr Ward the Board have told the Central Medical War Committee that he cannot be spared at present. Corpl W T Merrick, son of Mr T Merrick, Browsover, was wounded in Salonica on April 25th in the neck and left shoulder. Mr & Mrs Deacon, of Newbold-on-Avon, received official intimation on Thursday that their son, Pte J Deacon, Oxford and Bucks Light Infantry, was wounded in Salonica on May 10th. He is 21 years of age, and was employed at Mr Hunter’s Carriage Works prior to the War. Mr T H Loveland, monotype mechanic, employed by the “ Advertiser ” Company, has this week joined the Colours. Mr Loveland is a Past Chief Ranger of the Loyal Stephenson A.O.F, and Thursday, before leaving, Mr W J Torrance, on behalf of the officials and members of the Court, presented him with a useful wrist watch as a mark of esteem and appreciation of his services in all the offices has passed through. A queer experience recently befel Pte W Liggins, of the Army Veterinary Corps, who spent final leave in Rugby this week. One day, when entered the stable at the depot, he recognised one of the horses as one which was commandeered from his mother, Mrs Liggins, of James Street, and when he called the animal by its name it showed unmistakable signs of recognition. The name of Co-Sergt-Major A C Tomlinson, Rugby, of the old “ E ” Company, R.W.R. was included in the list of officers and men mentioned for distinguished service in Field-Marshal Sir Douglas Haig’s recent despatch. Sergt-Major Tomlinson has now left the Army, but has made application for a commission. The death has occurred of Pte Colledge, of a Canadian Regiment, son of Mrs Cleaver, and stepson of Mr T Cleaver, signalman, Benn Street, Rugby. Deceased was born at Long Lawford, but came to live at Rugby in his early years. When a young man, he was a prominent Rugby forward, a member of the Rugby Old Boys, and also a member of New Bilton St Oswald’s Football Team. He was also a member of the Britannia Band. Before emigrating to Canada about five years ago, he was employed at the B.T.H as a moulder, and he came back from Canada with a draft of soldiers some little time ago. In a letter from his Commanding officer to the Rev C T Aston, of Rugby, says : “ One of our stretcher-bearers informed me that Colledge went out to dress a friend who was wounded, and lying in the open, and evidently was instantly killed while engaged in this task. He was buried near where fell he fell on the battlefield, and when it is possible a cross will be erected to his memory. A letter of sympathy from the Commanding Officer has also been sent to Mrs Colledge. He leaves widow in Canada. Held at St Mary’s Hall, Coventry, on Friday last week. Present : Messrs K Rotherham (who presided), W Johnson, jun, G A Loveitt, and A Craig. Military representative : Lieut M E T Wratislaw. Agricultural representative : Mr J E Cox. Mr Gilk, of Grandborough, appealed for Harry Rabin (26), carter and shepherd, passed for general service, stating that Rabin was the only man employed on a farm of 295 acres. He said he could not manage with a substitute who knew nothing about the work.—The Chairman : We all have to have substitutes and have to teach them.—Lieut Wratialaw said a substitute had been sent, but Mr Gilks would not take the man until he knew the result of that appeal.—Mr Cox said that, according to the recommendation given the substitute by two farmers, Mr Gilks should give the man a trial.-The Chairman : You have not taken the trouble to try the man. The appeal must certainly be dismissed. Coming to the case of Wm Cox, wagoner, The Ford, Churchover, Lieut Wratislaw said the employer—Mr Towers—had accepted a substitute.—Cox said he had got three children, one of whom was a cripple, and they had to be nearly 1½miles for bread and groceries.—Lieut Wratislaw said there was no obligation on Mrs Cox to remain in her present cottage, but Mr Towers was quite willing for her to stay there so that when the husband returned he would find his family in the cottage, and would be able to resume his employment.—The Chairman told Cox they had many cases which were even harder than his, and it was impossible for the Tribunal to do anything for him.—The appeal of the Military would be allowed, but the Tribunal would ask them to give 28 days, so that some arrangement could be made for the wife and family. SCAVENGING CONTRACTORS TO JOIN UP. The Rugby Rural Tribunal had exempted till next Michaelmas Samuel Upton, 30 New Street, New Bilton, on the ground that, with his brother George, he held a scavenging contract under the Rugby Rural District Council.-Lieut Wratislaw said in Upton’s family there were five people on about 35 acres of land, not one of whom was serving.—Mr Worthington said the man and his brother did the scavenging at Hillmorton and Clifton, which took them four days a week. The brothers held 35 acres of land, and the father an additional 37 acres.-Mr J E Cox said if the scavenging took four days a week it was evident the brothers could not devote very much time to the land. If Mr Geo Upton could get someone to assist him with the scavenging it looked as if his brother could be released.—The Chairman : That is the view of the Tribunal.—Mr Cox said if the scavenging could be dropped in one village, it could be dropped in another.—Mr Worthington : I don’t know : there is a good deal of disease in the village.—Mr Cox : There will probably be less if they don’t it.—The Chairman said the Tribunal were unanimously of the opinion that the appeal should be upheld. Being of opinion that the slaughterers Rugby had been reduced to a minimum, the Rugby Urban Tribunal had refused to withdraw the conditional exemption granted to Fredk Wm Burbery (37), master butcher, 123 Abbey Street. Hence the Military appeal.—Lieut Wratislaw said in his original application Burbery stated : “ I have lost my assistant, and do my own killing, dressing, and selling.” He should call evidence to show that the “ assistant ” was only a boy who ran errands, and that at the time the application was filed a man named Robinson was doing the slaughtering. Mr Highton, Military representative for Rugby, gave evidence of what transpired at the local Tribunal on April 26th, when Burbery stated that he killed a beast, seven sheep, two pigs, and one calf a week.—Mr Harold Eaden : He did not represent that he himself killed the beast ?—Mr Highton : I say most emphatically that he did.—Mr Eaden : Do you know from your knowledge that one man cannot kill a beast by himself ?—A : I know there are certain men called slaughterers, who are always supposed to do the killing. John Henry Robinson said he was a slaughterman in the employ of Mr Dodwell. About two years ago he started killing for Burbery, who was then a foreign meat butcher, and he had an arrangement with him whereby he was paid 2s 6d for each beast and 2d for each sheep killed. He went into Burbery’s employ in April, 1915, and from that time until the 30th of April this year for him. During that time Burbery killed nothing himself to his knowledge. He was not what might be called a slaughterman. On April 30th, when in the ordinary way he went across to do Burbery’s slaughtering, he found the place shut up and the work done. Mr Eaden : You felt rather aggrieved ?—A : Yes. Q : Your feelings towards Burbery are not the best ?-A : It was not a nice trick to serve me.—Q : You are of military age and a general service man ?—A : Yes.—It is necessary under this arrangement between the Rugby Butchers’ Association and the Tribunal that you should do a certain amount of slaughtering ? Yes.—Not only for Mr Dodwell and others, but formerly for Mr Burbery ? Yes.—In consideration doing all that slaughtering, you are allowed to remain in civil employment ? Yes.—Mr Eaden : If you lost Mr Burbery’s slaughtering it rather imperils your position ? The Chairman : That is rather for the Military to say.—Mr Eaden : It shows the attitude.—The Chairman : I don’t think you can say so at all. Mr Eaden : A man who has been in the butchery trade for years, and has a knowledge of meat, might pick it up in two years ?—Witness : He might pick a certain amount up, but I could not say he would pick it all up.—Q : Would you agree he is a second-class slaughterman ?7 —A : No.—Q : You don’t call him slaughterman at all ? : No, sir.—Q : Although he helped you for two years ?—A : Yes.—The Chairman said there did not seem to be a shortage of slaughtermen at Rugby. A butcher seemed able get rid of one slaughterman to get another in.—Mr Eaden said Burbery was passed in B(2)—labour abroad.—The Chairman (to Burbery) : The trouble seems to have been that you said you were killing your own animals, which you were not doing.—Mr Eaden asked Burbery how many sheep he had killed this year without assistance ? and he replied 50 or 60. He had dressed them himself, and got them ready for the shop. The Chairman thought the man might be used as a substitute. Lieut Wratislaw said, subject to Mr Reeve passing him as a slaughterman (which he doubted), they might use Burbery as a substitute for a single man.—Military appeal allowed. Substitution order made, the man to report within seven days. A GUINEA A MINUTE FOR A SUBSTITUTE. “ told Mr Pearson (the manager of the Labour Exchange) that I would pay a guinea a minute if he would get me a substitute,” said Mr Sam Robbins, who appealed on behalf of William Law, cabinet maker and undertaker, 11 Hunter Street, Rugby.—Lieut Wratislaw said the Military felt that to act as an undertaker did not justify the retention of a category A man.—Mr Worthington said that at the outbreak of war the firm employed between 110 and 120 men, and now they had only seven left. He thought the Tribunal would agree that few firms had been more patriotic.—The Chairman asked how many of the men had gone into the Army ? Mr Robbins replied that the majority had done so, and about 10 per cent. had gone into munitions.—Mr Worthington said Mr Robbins never appealed for a man unless he was the last man left in department. This was the only cabinet-maker now left, whereas prior to the war the firm employed between 20 and 30 cabinet-makers. The Chairman said they quite felt that Mr Robbins had got a difficult job, and had been depleted most tremendously, but that was not what they were there for.—Mr Worthington : The man is 36 years age.—Lieut Wratislaw : And they are going to take up to 50. The only thing against this man is—he is a general service man, and a cabinet-maker is not of such high importance at the present time.—The Chairman said they wanted to help Robbins as much as they could. The Military appeal should be upheld, but they would give till August 8th, and no further application could made without leave, which meant that before the date named Mr Robbins must do all he could to get somebody else. Conditional exemption whilst in his present occupation as a seedsman, &c, had been granted to Albert Edwd Townsend, 229 Regent Street ; but the Military appealed against this.—Lieut Wratislaw stated that Mr Townsend was 34 years of age, and had been passed for general service. They said it was a useful business, but it was not in the national interest that a man passed for general service should remain in it. Mr Townsend wife and assistant could manage the shop during his absence.—Mr Eaden argued that the business in seeds carried on by Mr Townsend was at the present time of high national importance. Ninety per cent. of Townsend’s turnover was for vegetable and farm seeds.—Final exemption to July 8th granted. CONCERT.-An excellent concert was given at the Infirmary V.A.D Hospital on Thursday evening last week. All the artists, who displayed remarkable talent, are at present patients in the hospital, and the programme was highly appreciated by their fellow patients and the hospital staff. Songs were rendered by Ptes Head, Orange, Pinnell, Astridge, Heath, and Ord. Several of the wounded boys gave monologues and turns during the second half of the entertainment. They included Pte Green, ventriloquist ; Rifleman Pinnell, who was very funny as a Cockney girl at the theatre ; and two knockabout comedians, Whitwell and Wilson, both of whom deserve a wider range of popularity. SALE OF WASTE PAPER CONTROLLED. Under an Order issued by the Minister of Munitions no person shall offer to purchase or take delivery of any waste paper except under and in accordance with the terms of a permit issued by the Royal Commission on paper, and no person shall offer to sell, supply, or deliver any waste paper except to the holders of such licences, and in accordance with the terms of such permits to purchase or take delivery as aforesaid. Every holder of a permit under this Order shall furnish such return as to his purchases, sales, and deliveries of waste paper as shall be required by the Royal Commission on Paper. Mr J R Barker, who is taking the paper collected by the Rugby Waste Paper Committee, sorting and baling same, and sending to the paper mills to re-pulped, has been granted the necessary permit. PRIVILEGED NO LONGER.-The rooks which have for generations built their nests and reared their young in the topmost boughs of the stately elms in the School Close have always enjoyed a privilege extended to very few others of their species. The hand of the destroyer may have been set against rooks in the countryside, but so long as the fledglings of the School Close remained within the sacred precincts of their elms seater[?] they belonged to a race apart from the ordinary rook, and no shot gun or rook rifle has ever been aimed at them. But with the need to conserve our food supply comes also the need to protect it from the ravages of voracious rooks, and so during the last week, on quiet evenings when the birds have been taking an airing on the side of their nests or on the boughs in the immediate vicinity, a gentleman with a steady eye and trusty rook rifle has been taking heavy toll of them. BROWN.—In loving memory of Pte WILIE BROWN, King’s Own Scottish Borderers, son of Mrs. Brown, 15 Sandradice Street, Dundee. At rest. HARRATT.—On April 23rd (killed in action in Mesopotamia), Corpl. T. HARRATT. Also on May 3rd (killed in action in France), Pte. JOSEPH HARRATT, both late Monks Kirby. JONES.—On April 29th, Corpl. DAVID JOHN JONES (Jack), Essex Regiment, who was killed in France, the beloved third son of John and Mary Jones, the Red House, Shuckburgh ; aged 28. LEESON.—Killed in action on March 20th, ALBERT WILFRED (BERT). Sergeant in Northampton Regiment, dearly beloved third son of Mr. and Mrs. Leeson, Leicester, and dearly beloved grandson and nephew of Mr. and Mrs Leeson, Newbold-on-Avon ; aged 21 years and 11 months. “ Not gone from memory. HUNT.—In loving memory husband, ALBERT JOHN HUNT, Warrant Officer of the 15th Brigade, R.H.A., of the immortal 29th Division, killed in action in Gallipoli on May 27, 1916. “ They whom Thy love hath guarded long. They whom Thy care hath rendered strong. Their heart strings round Thy heart entwine. Cecil Stanley Inwood was born in Rugby in 1897. His father was Thomas James Inwood from Weston Turville in Buckinghamshire. His mother was Hettie Melinda (nee Noon), of Whilton, Northants. They married in Whilton on 25th May 1896. Thomas living in Rugby at the time, his father was running the Queen’s Head pub in Little Elborowe Street. Thomas worked for the Post Office, as a Stamper and later Mail Porter. Cecil was their only child, a daughter was born and died in 1900. The family lived at 12 Lodge Road, Rugby. Cecil attended Elborowe School and on leaving, became an Electrical Apprentice with Mr S P Martin in Regent Street. Cecil Stanley Inwood joined the Worcester Regiment under the group system, in late 1915. He was a private, no. 29753. The 14th Battalion, Worcester Regt. was formed in autumn 1915, one of the new “Pioneer” Regiments. They were first quartered in Norton Barracks in Worcester, moving to Salisbury Plain in Spring 1916. Training on Salisbury Plain was hard, since technical knowledge was added to battle training. They left on 19th June 1916 and arrived in France on the morning of 21st June. By 23rd June they reached billets on the front at Chamblain Chatelain, where they became part of the 63rd (Royal Naval) Division. In October they moved to the Somme front. A stay in Englebelmer was long remembered in the Battalion, due to the large number of rats in the deserted village. It was a relief to leave and live under canvas, even though it was November. They took part in the Battle of the Ancre, consolidating captured defences and building new communication trenches. On 14th November, a party from 14th Worcester helped to dig out two tanks, stuck in mud. Operations began again in mid January 1917, constructing trenches and wire entanglements. By the end of February, there was news that the enemy had evacuated all their front-line defences, east of Miraumont, and all companies of the 14th Worcestershire were recalled from other work and set to the construction of roads across the evacuated land. They returned to Flanders at the start of March and remained in the area until the 7th April 1917, working and training. The 14th Worcestershire were employed near Gavrelle at the start of the Battle of Arras, fully occupied in work on roads in the battle-area just north of Arras, but when the enemy counter attacked on 29th April, they took part in fighting. The advance was checked and the next three weeks many working parties were sent out. On 20th May they returned to their former camp on the Arras-Lens road. War Diaries 14th Bn Worcestershire Regt. During these five days the Battalion working at night have continued work on the Divisional Front making Front & support trenches and communication trenches between them and have sustained the following casualties. The total casualties for the month are killed 6 other ranks, wounded 23 other ranks. The death took place in a hospital in France on Whit Sunday of Pte Cecil Stanley Inwood… who was wounded by a sniper a few hours earlier. He died on 27th May 1917 and was buried at Duisans British Cemetery, Etrun. The site of a Casualty Clearing Station 9 kilometres west of Arras. Archibald ‘Arch’ Canham’s birth was registered in the first quarter of 1883 and he was baptised on 27 April 1883 at St. Andrew’s Church, Rugby. He was a son of John Canham, a groom from Hatfield, Hertfordshire and Alice née Kaye Canham who was born in Cobham, Surrey, and the couple married there on 20 September 1876. In 1883 the family lived at 5 James Street, Rugby. Arch was one of six children. He had three sisters: two elder: Milly (1877-1926) who married Will Procter and lived in Grosvenor Road, Rugby; and Elizabeth (1879-1933) who never married; and one younger, Alice, who died aged eight, in 1892. He had an older brother John ‘Jack’ who was a storekeeper at BTH and a younger brother, Joe, who worked as an engineering machinist at Lodge Plugs. Joe married Mary Louisa Lloyd in 1925 and her brother Bert Lloyd opened and ran Clifton post office. 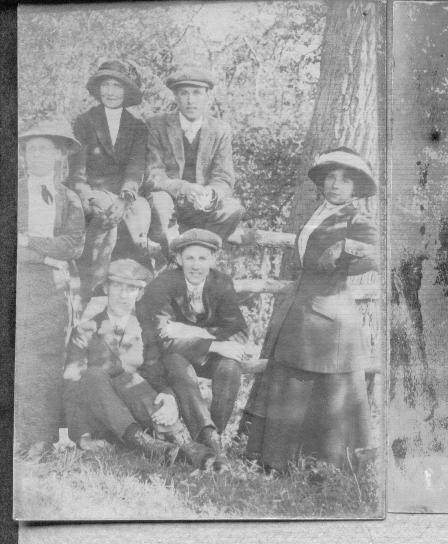 The photograph shows Arch and his wife, Laura, sitting on the fence. Milly is on the far right, and Elizabeth is pictured left. Joe is in the centre. The identity of the man next to Elizabeth is unknown. In 1901, aged 18, Arch was working as a house painter, and presumably working on a contract as he was living in Buxton, Derbyshire, and in lodgings together with several other painters. Buxton was an expanding spa town (work was begun on Buxton Opera House in 1901, and it opened in 1903). It is just possible that Arch and the other painters also worked there. His father, John Canham, died in October 1907 after he was kicked in the stomach by a horse. He was buried at St John’s, Hillmorton. In 1911, Arch, aged 28, and still single, and living back at home with his widowed mother and his 16-year-old younger brother Joe in Hillmorton. At some time prior to WWI he must have started working for the local building firm J. Parnell and Son. He married Laura Emily Knight on 25 March 1913 at the Church of the Holy Rood, Daglingworth, Gloucestershire. Little is known of her, or how it was that they came to meet. Their daughter Muriel Mary was born in Rugby on 30 December 1914, when the family was living at 19 Benn Street. There was little information on his Medal Card, but fortunately his Service/Pension Record is one of the small number still available. He took the Attestation oath at Rugby on 10 December 1915 when he was a ‘painter and paper hanger’. He was then 33 years old; 5ft 6in in height; and had an ‘amputation terminal phalanx left index finger’, i.e. he had lost the top joint of that finger. He was still at 19 Benn Street. He was posted on 27 May 1916 and his papers noted he was ‘appointed’ to the Royal Garrison Artillery, the documents being stamped ‘Plymouth’ on 30 May 1916. ‘Arch’ joined up as No.86927 [on his Medal Card] and 86972 [on his initial CWGC grave registration record, but later corrected], in the Royal Garrison Artillery and was in the UK on ‘home service’ for nearly a year from 27 May 1916 until 17 May 1917. He was first posted to No.3 Depot RGA from 27 May 1916, then to 36 Company on 3 June 1916. On 13 January 1917 he was posted to the ‘Signalling School’ where he passed his ‘1st Class Signalling and Telephony’ course at Hepswell Camp – at Catterick, Yorkshire – on 24 January 1917, a mere ten days later! He was apparently posted near the end of this short course to the ‘A Depot Siege Artillery’ on 20 January 1917, and then to his unit, the 332nd Siege Battery on 15 February 1917. His ‘overseas service’ in France commenced on 18 May 1917 when the Battery embarked at Southampton and disembarked the next day at Le Havre. They went out to the Western Front armed with four 6 inch howitzers. The unit first went into the line at Ploegstreet and Le Bizet [both in Belgium near the French border], before moving to Ypres. However, a mere nine days after arriving in France, he was acting as a signaller and was involved fierce fighting at Pont-de-Nieppe. Nieppe is a French village four kilometres north-west of Armentieres on the road to Bailleul. The bridge at Pont-de-Nieppe had been seized by the 1st Hampshires on 16 October 1914 and the village then stayed in Allied hands until 11 April 1918. Arch’s unit would probably have been mobilised and brought forward to assist in the preparations for the Battle of Messines on 7 June 1917. This was an attack on the Wyschaete-Messines Ridge, south of Ypres in the Vimy to Arras sector. There was a seven day preliminary artillery bombardment before the infantry assault and many of the infantry battalions had been billeted in Pont-de-Nieppe before going forward to the farms around the south and west of Ploegsteert Wood. The Germans were aware that an attack was imminent and would no doubt have been trying to disrupt the build up and emplacement of artillery, as described in the published diaries of two Australian gunners, Harrold ‘Hal’ Stevens and William ‘Billy’ O’Neil who described their time in Nieppe during the period leading up to, and indeed after, 27 May 1917. Hal’s Diary – 24th May. All guns taken away and placed in a line ‘shoulder to shoulder’ for what appears a big offensive. Guns of all calibres. We are on the eve of great things and I pray I may be spared to see it through although it will be a fearful experience. Still I would not miss it for any money. Hal’s Diary – 27th May. Another of our guns smashed to be taken to ordinance depot as a shell struck it today. We have no cover now. When will the strafe occur? Our positions were not occupied as fresh orders were to hand and great ‘goings-on’ forecast – there was to be a big offensive on a grand scale. The eighteen pounders were to be shoulder to shoulder for miles and miles and guns of all calibres were to be in support! It was the eve of great and far-reaching events! So the rumours circulated. … The battery had orders Heavy batteries were drawing big guns by motors, the naval pieces with their extremely long barrels, and in contrast the ‘hows’ thick and short, all assembling steadily for the big ‘stunt’. … The guns were in their new positions with heavy English guns on their left. The latter had been having a hectic time and had lost several men and an officer. Nearly every day the enemy was doing some execution and the strange part was that very little counter battery work was being done by the British. It was thought that the idea was to keep the location of the batteries a secret until the day of revenge. Anyhow, it was galling to be doing so little and receiving so much from the opposition. Several men were killed near by, but none of Billy’s companions were hurt, and they were moved to a flank as the shelling was severe all around them. Shelling woke us up – they were after dump behind us. ‘F’. Sub. put out of action and some Tommies on left killed. Maybe it was Arch who was one of those ‘Tommies’ or among those ‘several men’ who were lost. It was during this period he was wounded, and he died ‘in the field’ from his wounds on 27 May 1917. He had served for 1 year and 167 days. A confirmatory copy Death Certificate was later issued. Arch was buried in Plot: II. D. 8. in the Pont de Nieppe cemetery, Nieppe, in the Departement du Nord, France. His memorial stone has the added words from his widow, ‘Thanks be to God that such have been’. Nieppe is a village 4 kilometres north-west of Armentieres on the road to Bailleul. The village was in the Allied hands from mid-October 1914 until 11 April 1918. Pont-De-Nieppe Communal Cemetery was used by Commonwealth field ambulances and fighting units from October 1914 to March 1918. Administration was granted in London to his widow, Laura Canham, on 19 June 1918. His Estate was valued at £267-6-10d. His address was given as the family home at 19 Benn Street, Rugby. After Arch’s death, his wife’s mother became ill. Laura sold the house in Benn Street and before 13 October 1917 she had returned home to Grove Hill, Daglingworth, near Cirencester. Correspondence exists regarding Arch’s plaque and scroll and giving this address on 15 April 1919 and also when she acknowledged receipt of his ‘British War and Victory Medals’ on 2 May 1922. A letter dated 12 December 1917 advised that Laura was awarded ‘… a pension of 18/9 a week for herself and one child with effect from 17/12/1917 …’. Arch’s service papers also include details of his family and next of kin which were provided by his widow on 30 April 1919. She was still living at 19 Benn Street, Rugby, as was their daughter Muriel Emily Canham. His mother was widowed and living at ‘Hillmorton, nr. Rugby’. His elder brother, John Canham was now 38 years old and living at 36 Caldecott Street, Rugby and his younger brother, Joe was 23 and also living in Hillmorton. His elder sister, now Mrs. Emily [Milly] Proctor, was 42 and at 110, Grosvenor Road, Rugby; and his other sister, Miss Elizabeth Canham, was 40 and at Bell Field, Peter’s Green, Luton. Arch’s sister, Milly’s husband, Will Procter, died in the flu epidemic on 16 March 1920. Milly apparently never got over it and she died in 1926. Their mother, Alice, died in August 1929, and her funeral service was at the Mission Hall, Hillmorton. His sister, Elizabeth died in 1933. His elder brother, Jack lived on until 1941, dying at the age of 60, and his youngest brother, Joe, died in 1975. Both brothers had married and had children. Archibald Canham is commemorated on the War Memorial Gates in Hillmorton Road, Rugby and also on the Hillmorton War Memorial. He is listed as being Killed in Action on the J. Parnell and Son, Roll of Honour, but has been recorded incorrectly as being in the Royal Warwickshire Regiment. 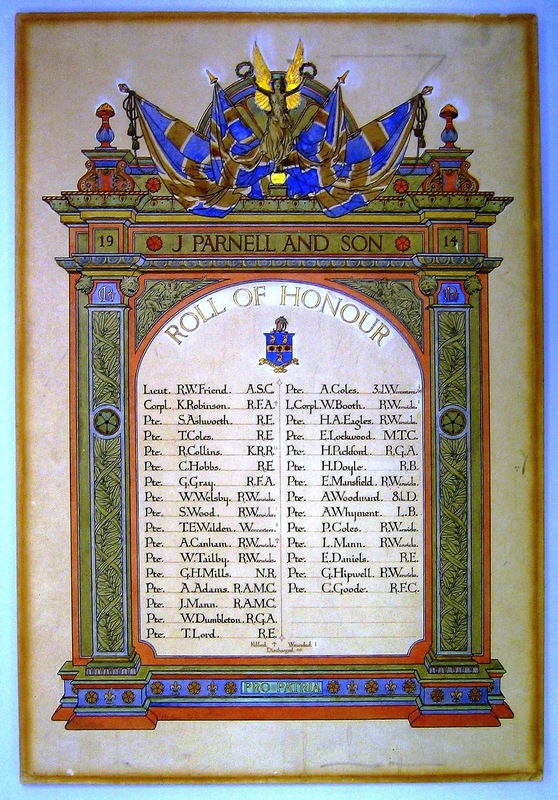 The original Parnell ‘Roll of Honour’ was produced in late 1916 and contained ‘…. the names of 22 men who have enlisted from the yard and shops. The ‘roll’, which was tastefully designed and executed by Mr. F. J. R. Cole, Rugby, with appropriate and patriotic embellishments, was framed in oak, and the names enrolled thereon …’. Nine further names were added to the Roll of Honour later, and Archibald Canham, who was still ‘serving’ at the date the Roll was first made, would be later marked as having been killed. This article on Archibald Canham was researched and written for a Rugby Family History Group [RFHG] project, by John P H Frearson and is © John P H Frearson and the Rugby Family History Group, July 2014, and updated May 2017. Many thanks are due to Elaine Canham of Rugby, whose husband is Arch’s great nephew. Her report on Archibald Canham and her family photograph have been incorporated into this study with her permission. Alison Miller (Editor), Death sat on a pale horse – The World War One diaries, letters & sketches of Harold Stephens and W. ‘Billy’ O’Neil, Midlands Heritage Press, Newstead, 2008. See: http://www.hudson-publishing.com/sitebuildercontent/sitebuilderfiles/alisonpagesample.pdf. The Roll of Honour is held at the Warwick Modern Records Centre and reproduced with their permission. Rugby Advertiser, 2 December 1916. The report contains a number of discrepancies especially in the initials . Henry John Gerrard HUDSON, was born on 11 November 1873 in Whitechapel, Middlesex. He was the son of John Gerrard Hudson, who was a ‘Paper Stainer’. Henry was apparently already working as a ‘Paper Stainer’, like his father, when at the age of 16, he joined the Navy and with the number: 147608, first served from 5 to 9 January 1889 on HMS Impregnable, a training establishment at Devonport, and then on HMS Ganges, another training establishment. He later returned to HMS Impregnable and then was posted to HMS Ruby, a composite screw corvette launched in 1876. HMS Ruby was at Sheerness when Henry was enumerated, aged 17, for the 1891 census. Over the next ten years his Navy Service Record shows he was on some eight different ships or shore stations. In 1892 he became an Able Seaman, and in 1897 a Leading Seaman, but then was dropped back to Able Seaman. He does not seem to appear on the 1901 census, but his Record shows that he was on HMS Caesar, a Majestic-class pre-dreadnought battleship and had regained the rank of Leading Seaman. Over the next couple of years he served on a further four different ships, and then seems to have left the Navy on 13 May 1902, presumably having completed the 12 years service that he signed up for. He probably returned home to London, as some five years later he married Alice Emily Martin on 13 January 1907 at All Souls, Newington, Southwark. He was 33 and she was from Bermondsey and was 28. They seem to have remained in London for a while as their first two children were born there: Nancy Hudson was born in Walworth in about 1909, and Gladys Hudson in Camberwell the following year. However, by 1911 the family was living at 13 Southview Road, Weymouth, Dorset, and Henry was again associated with the sea, being a ‘Motor Boat Driver, General Providers’. At some date between 1911 and 1914 the family moved to Rugby, and it is likely that they had a further child, a son, John G Hudson who was registered in Q2 1914. By 1914, Henry was working at BTH, in the Wiring Dept. ‘Hudson’ was listed among the latest recruits from the BTH Works in September 1914. HMS Pembroke was the name given to a shore barracks at Chatham. It was commissioned in 1878, moved ashore in 1903 and was paid off in 1983. The buildings, designed by Sir Henry Pilkington, now house the University at Medway. A number of ships were renamed Pembroke while serving as base and depot ships for the establishment: HMS Trent was HMS Pembroke from 1905 until 1917. Leading-Seaman Henry Hudson died, aged 43, on 20 May 1917 ‘… at R N Hospital Chatham, after a serious operation’, although another record suggests that he ‘Died from disease’. This was probably part of the shore based HMS Pembroke and became the Royal Naval Hospital in Windmill Road – which is still known as the Medway Maritime Hospital. He was buried in Gillingham (Woodlands) Cemetery in Grave Ref: Naval. 27. 1421. The cemetery has a large naval section reserved by the Admiralty and that section contains most of the war graves as well as burials of the pre-war and inter-war years. Henry probably only served on land stations during WWI, as he was already a ‘Leading Seaman (retired)’, but he was awarded the British War Medal – the criteria being 28 days mobilised service, but without a requirement for overseas service. There is no record of him receiving the Victory Medal for which recipients had to be mobilised and to have entered a theatre of war. At the end of the war his widow’s address was noted as 1, Bakehouse Lane, New Bilton, Rugby. Henry John Gerrard Hudson is remembered on the Rugby Memorial Gate. He is also remembered on the New Bilton War Memorial, by the chapel in Croop Hill Cemetery, Addison Road – the Memorial reads ‘In the Great War these died for England 1914-1919’. This article on Henry John Gerrard HUDSON was researched and written for a Rugby Family History Group [RFHG] project, by John P H Frearson and is © John P H Frearson and the Rugby Family History Group, May 2017. Rugby Advertiser, 26 September 1914. Rugby Advertiser, Deaths, 26 May 1917. For good work at Caterham and other places, the Royal Red Cross has been bestowed by the King upon Miss E C Ellis, who for several years before the War commenced had been living in Horton Crescent, Rugby. Miss Ellis went up for investiture last week, and was received by the King and Queen at Buckingham Palace, and subsequently by Queen Alexandra at Marlborough House. OLD ST MATTHEW BOY HONOURED.—P.C Herbert Archer, of the Metropolitan Police Force, son of Mr T Archer, of 41 York Street, has recently received the King’s Medal in recognition of bravery he displayed in March last year, when he rescued a boy from drowning in a caisson chamber at Rosyth Dockyard. The depth of the water was 40ft, and the constable showed conspicuous heroism in effecting the rescue. It was dark at the time, and he incurred great personal risk in entering the water. He has been presented already with the Royal Humane Society’s Medal and honoured by the Carnegie Hero Fund Trustees. The King’s Police Medal is usually handed to the recipient by his Majesty in person ; but owing to the War the presentation ceremony took place at the Dockyard, and the medal was handed to P.C Archer by the Rear Admiral Superintendent, who pointed out that this medal was not easily gained, but was only bestowed in cases of exceptional gallantry. P.C Archer, who was an old St Matthew’s boy and played in the first team from that school to win the Rugby School Shield in 1904-5, suitably replied. The name of Sec.Lt. M H House (Rifle Brigade) is amongst the latest published list of officer casualties. At Rugby School he was in Mr G F Bradby’s house and was a prominent member of the 1916 Cricket XI. Capt and Adjt R M Gotch, Sherwood Foresters, wounded and missing on July 1, 1916, now believed killed, gained his football cap at Rugby School, and during the 1913-14 season played forward for the Harlequin. Sergt P G Miles, of the Royal Warwickshire Regiment, for several years a constable in the County Police Force, has been wounded in France. Miles was formerly in the Rugby and Stratford-on-Avon Division. Capt Percy H Hollick, Royal Warwickshire Regiment, is the fifth Coventry solicitor who has died at the front. A son of the late Mr Alfred Hollick, an Allesley farmer, the young officer was articled to his profession in Coventry, and early in the War joined the Honourable Artillery Co., and subsequently obtained his commission. He was wounded more than once. Mr J Young, 37 Pinfold Street, New Bilton, has received information that his only son, Pte W C Young, of the Worcester Regiment, was killed in action on April 24th. Pte Young, who was about 23 yearn of age, was employed at the B.T H Lamp Factory, and enlisted in March, 1916. DEATH OF A FORMER B.T.H PUPIL IN FRANCE. Members of the Rugby Men’s Adult School learnt with sincere regret on Sunday morning of the death of Mr Kenneth Smith, who until the War broke out was actively associated with the school, and was working as a student apprentice at the B.T.H Works. It was decided to ask Mr Herbert Edmundson, the school president, to send a communication to the bereaved relatives, indicating the sense of the loss sustained by the school, and expressing appreciation of the high character of the late Mr Smith. SERGT-MAJOR CLEAVER DIES OF WOUNDS. Company-Sergt-Major Cleaver, Royal Warwicks, was wounded in action on May 8th, and died the following day. He was a native of Stockton, and had served upwards of 21 years in the Army, during which period he saw much foreign service. He went all through the South African campaign, and gained the Queen’s Medal and six bars. He was also mentioned in despatches on September 4th, 1901. He had a medal for 19 years’ long service and good conduct. After a serious operation, he was appointed drill instructor to the 7th (T) Royal Warwickshire Regiment, and was two years at Coventry and five years with “ E ” Company at Rugby, residing at the Drill Hall Cottage. He was mobilised with the battalion on the outbreak of War ; and in June, 1915, was promoted warrant officer. Deceased who was 42 years of age, leaves a widow and five children, for whom much sympathy is felt. RUGBY & DISTRICT WAR PRISONERS’ DAY, Saturday, June 2nd. There are sixty-seven men from Rugby and district who have fallen into the hands of the Enemy, and they are still calling for food. For nearly two years the Rugby Committee have organised funds by means of which beyond any shadow of doubt many of these men have been saved from starvation. To ensure they do not lack the food necessary to keep them in health and strength, further funds must be raised at once. THE RUGBY PRISONERS OF WAR HELP COMMITTEE therefore appeal to you to assist their efforts by sending a Donation now to the Hon. Organising Secretary, Mr. J. REGINALD BARKER, 9 Regent Street, Rugby, who will gratefully acknowledge same. THE FOOD PROBLEM IN RUGBY. There can no longer be any doubt that the food position in this country is serious. If scarcity, amounting to real want, is to be avoided, every class must practice the strictest economy in the consumption of all bread-stuffs. The German submarine campaign, coupled with a short wheat harvest last season throughout the world, has brought our surplus stocks of corn to danger point. It should be clearly understood that the officials of the Food Ministry are watching carefully from day to day the danger-line below which the stocks of cereals in this country cannot be allowed to fall ; and although preparations are in progress to establish rationing machinery when the point of danger has been reached, it is hoped that the success of the voluntary campaign may avert the necessity for compulsion. The issue really rests with the people. The Rugby Waste Paper Committee was registered under the above Act.—The Chairman said it would be very interesting to Council to learn that Mr Barker had already collected something like 3 tons of waste paper.—Mr Evers congratulated the General Purposes on the arrangements made.—The Chairman : No thanks are due to the committee. The arrangements were made by Mr Barker and Mrs Blagden.—Mr Yates : Then congratulations are due to the committee for not stopping these people in any way (laughter). A letter was read from Captain Fuller, thanking the Council for their kindly recognition of the V.T.C and the promise of financial support voted at the last meet of the Council. He assured them that their help and expression of goodwill would be of great assistance to them. The A and B men of the Battalion had been selected with similar men from one of the other battalions in the regiment to into the front line in the event of any invasion emergency arising, and they looked upon this as a compliment, and hoped it would be the means of more men joining the Corps, whose past excuse had been that them was no use for the force. He hoped the Local Government Board would raise no difficulty to the amount voted being handed over for purpose of Rugby Corps, and he added that he had noticed lately that where similar grant was made by a council the money was refunded by the Territorial Force Association to the Corps in consequence of the intention of the gift being expressed to be for the benefit solely of particular a corps. With reference to the last paragraph, the Council agreed with the Chairman that it was their wish that the grant should be applied solely for the use of the Rugby Corps.—Mr Wise said he was sorry that so few members of the general public were present at the inspection on Sunday. Anyone who was there must have been struck by the smart appearance the Corps made and the wonderfully efficient way in which they did their drill. PORTER.-In loving memory of our dear son and brother, GEORGE RUPERT PORTER ; aged 21 years. Killed in action at St. Elia on May 8, 1915. ROBINSON.-In ever-loving memory of FRED, who gave his life for his country on May 11, 1915.-“ Lost but never forgotten.”-BEATIE. YOUNG.-In loving memory of PTE WILLIAM COTTERILL YOUNG, who was killed in action with the Forces in Salonika, on April 25th, 1917, the 25th year of his age. Deeply mourned. Where sleeps our loved one among the brave. And for the land he loved he gave his all. —From his FATHER and MOTHER and SISTERS, 37 Pinfold Street, New Bilton. Rugby. John Robert HANDYSIDE was born in Newcastle upon Tyne in 1886, the son of John and Jane Handyside. He was baptised on 15 September 1886 at St Anne’s, Newcastle on Tyne. In 1901, John’s father was a ‘Blacksmith’s Labourer’ and the family lived at 15 Rippenden Street, Byker, Newcastle upon Tyne. John was then 14 years old and had five younger siblings. In 1911, John, now 25 and still single, was a labourer in an engineering works and still at home with the family. A family of eight in a three roomed house would have been somewhat crowded. Sometime between 1911 and 1914 John moved to Rugby to work ‘… at Messrs Willans & Robinson’s, and lodged at the house of Mrs Hayward, 43 Lodge Road, Rugby’. A later report confirmed that John ‘… enlisted as a gunner on September 3rd, 1914, and has now been promoted to the rank of Corporal.’ He enlisted initially as No. 11029 with ‘D’ Battery, 71st Brigade, Royal Field Artillery. 71st Brigade was part of the New Army K2 and its service is summarised below. ‘LXXI Brigade, Royal Field Artillery, made up of 223, 224 and 225 Batteries RFA and the Brigade Ammunition Column served with 15th (Scottish) Division. 15th (Scottish) Division was formed in September 1914, as part of Kitchener’s Second New Army. In February 1915 the three six-gun batteries were reorganised to become four four-gun batteries and were titled as A, B, C and D. 71 Brigade proceeded to France in the second week of July 1915. They were in action in the Battle of Loos in 1915. In spring 1916, they were involved in the German gas attacks near Hulluch and the defence of the Kink position. On the 22nd May 1916 the Brigade Ammunition Column merged with other columns of the divisional artillery to form the 15th Divisional Ammunition Column. On the 7th of June 1916 D Battery exchanged with C Battery, 73 (Howitzer) Brigade of the same division, each adopting the others name. 71 Brigade were in action during the Battles of the Somme, including the Battle of Pozieres, the Battle of Flers-Courcelette and the capture of Martinpuich, The Battle of Le Transloy and the attacks on the Butte de Warlencourt. The brigade was reorganised in early December 1916. C Battery was split between A and B Battery to bring them up to six guns each. B Battery, 73 (Howitzer) Brigade joined and was renamed C Battery, 71 Brigade. On the 22nd of January 1917 a section of two howitzers from 532 (Howitzer) Battery, 72 Brigade joined to make D (Howitzer) Battery up to six guns. One of John’s three Medal Cards shows that he went to France on 8 July 1915, which agrees with the above 71st Brigade history. This may have been the occasion when, as a Corporal, another Medal Card noted that he was ‘Mentioned in Dispatches’. Sometime before the end of November, whilst he was an Acting Bombardier and still in ‘D’ Battery, 71st Brigade, Royal Field Artillery he was awarded the Distinguished Conduct Medal (DCM) and there were several [similar] reports. ‘ANOTHER RUGBY MAN AWARDED THE D.C.M. In addition, he was also awarded the Medaille Militaire, and was subsequently promoted to Sergeant and it might have been during the reorganisation of the 71st Brigade in early December 1916, that he was promoted to Sergeant and transferred to ‘C’ Battery, 70th Brigade, Royal Field Artillery. 70th Brigade was also part of the New Army K2, and also in the 15th Division, indeed the 70th, 71st and 72nd Brigades were largely working together and in May 1917, were generally in the Feuchy to Tilloy areas to the East of Arras. This was during the aftermath of the Battle of Arras which had been in progress from 9 April to 16 May 1917, with the 70th Brigade in the Tilloy area. Some time during this ‘Quiet day …’, 19 May 1917, John Handyside was ‘Killed in Action’. John was buried in the Faubourg D’Amiens Cemetery, Arras in Grave: V. F. 13. There was no additional inscription on his headstone. The Faubourg-d’Amiens Cemetery is the main CWGC cemetery in the western part of the town of Arras. The Commonwealth section of the cemetery was begun in March 1916, behind the French military cemetery established earlier. It continued to be used by field ambulances and fighting units until November 1918. John R HANDYSIDE was awarded the Victory and British Medals and the 1915 Star. He is remembered on the Rugby Memorial Gates and in St. Philip’s Church, Wood Street, Rugby. His mother as Sole Legatee received John’s outstanding pay of £41-0-11d on 11 September 1917; then a further £1-2-0 on 13 October 1917; and a War Gratuity of £15-10-0 on 24 October 1919. She received a further Gratuity for his D.C.M. of £20-0-0d on 28 September 1921. This article on John R HANDYSIDE was researched and written for a Rugby Family History Group [RFHG] project, by John P H Frearson and is © John P H Frearson and the Rugby Family History Group, May 2017. Rugby Advertiser, 4 December 1915; as reported in Rugby Remembers, https://rugbyremembers.wordpress.com, 4 December 1915. Rugby Advertiser, 5 September 1914; as reported in Rugby Remembers, https://rugbyremembers.wordpress.com, 5 September 1914. Rugby Advertiser, 1 January 1916; as reported in Rugby Remembers, https://rugbyremembers.wordpress.com, 1 January 2017. The Medal Card mentions ‘London Gazette, 1/1/16 p.19 [or 9]’ although this has not been found. The London Gazette, 26 November 1915, Supplement: 29384, Page: 11896; also The Edinburgh Gazette, 1 December 1915, Issue: 12878, Page: 1822; also Rugby Advertiser, Saturday, 1 January 1916. Rugby Advertiser, 4 December 1915; as reported in Rugby Remembers, https://rugbyremembers.wordpress.com, 4 December 1915; also Rugby Advertiser, Saturday, 1 January 1916. In April 1917, XVII Corps attacked east of Arras near the River Scarpe, but was bogged down in rain and snow. From a report of the unveiling, Rugby Advertiser, 12 November 1920, see http://www.rugbyfhg.co.uk/rugby-st-philips-church. It is not known if the Memorial in St Philip’s Church still exists. Arnold Vincent Denys Wise was born in Rugby according to various census. His birth was registered in Rugby registration district in September quarter 1893 and he was baptised at St Matthews church on 23rd July 1893. He was the son of Thomas Arnold Wise and Fanny Estelle Shortland, she was born in India and the marriage took place in the Isle of Wight in September quarter 1891. AVD Wise was at home in the school “Oakfield” at 21 Bilton Road, Rugby, where his father was a schoolmaster. According to the 1901 census he is aged 7, born Rugby. In the 1911 census he was at Leconfield school, Cheltenham, now Cheltenham College aged 17 born Rugby, Warwickshire. On the outbreak of war he joined the Royal Engineers with the rank of 2nd Lieutenant and was posted to the 2nd Field Squadron. He was later promoted to the rank of Lieut on 25 June 1915. He was awarded the Military Cross. Army service record not found at Kew, though Long number 20807 found. Rugby Advertiser of 26th May 1917 records the death of Captain Arnold Vincent Denys Wise of the Royal Engineers on 15th May 1917. He was killed by a fluke shot from the burst of an automatic at some 800 to 1000 yard, living for about half an hour afterwards. He was mentioned in despatches in January 1916 and awarded a Military Cross in February 1916. The Advertiser has more detailed information about his career.